Derry City and Strabane District Council has confirmed it’s investigating a dog attack in Strathfoyle, which left a young mother requiring hospital treatment. Áine McIvor was left shaken and bloodied after the incident, which occurred on Tuesday, February 7. She said she was out walking her pet Bichon Frise, ‘Snowy’ with her six-year-old daughter when they were set upon by what she described as a Staffordshire-type bull terrier. “We were walking up along Otterbank Road and the next thing this black dog some running out and starts attacking us,” she said. Ms. McIvor said she repeatedly attempted to wrench the terrier off the family pet during the incident, which, she said, seemed to last for minutes. “I just kept trying to pull it off my dog but it kept biting it. It was horrible,” she said. Eventually, a passer-by, intervened and helped Ms. McIvor ward off the canine attacker. However, the Strathfoyle mother and daughter were both left in a state of shock. Ms. McIvor suffered injuries to her hands, which had to be treated in hospital following the incident (see picture). ‘Snowy’ was also taken to the vet treatment to cuts and bite marks sustained in the attack. “There was blood and hair everywhere. I was just in shock after it,” she said. 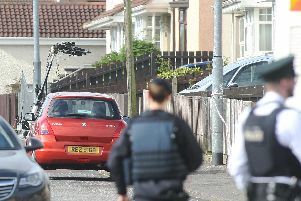 A spokesperson for Derry City and Strabane District Council said officers were aware of the incident and are currently investigating the matter. Ms. McIvor praised dog control officers from Derry City and Strabane District Council who visited her in relation to the incident last week. She said they told her that the process of identifying the dog and its owner was continuing.